A well maintained yard is both attractive and important to the health of your landscape for a variety of reasons. We all want a yard that looks manicured and well cared for, and limbing up trees is an important aspect of that look. A big reason to limb up trees is for aesthetic purposes. A shapely tree looks a lot nicer that a tree that has been left unattended. We regularly trim our hair…why not our trees? Another very important reason to limb up trees is to allow more sunlight to reach the ground. In woodland areas, you won’t need to do this, however, in areas where your plants are looking leggy, or you are trying to grow grass, or if certain shrubs just are not flowering like they should, you’ll need to see what you can do to bring more light to the ground. Short of cutting the trees down, limbing up is the next best thing. All these reasons made me think about the trees on our property and how many of them were looking overgrown and unkempt. Take for example our weeping cherry trees. This is a picture from Spring time, when the trees were just beginning to bloom. They are “weeping” so much, that they are hanging over the fence. They look overgrown and really sparse in areas. Limbing up the lower branches of the trees will allow more light to the grass and gives them a shapely appearance. Notice the dead grass in front of the fence? Now that the limbs have been removed, new grass will begin to grow in that area. Our cherry trees typically produce real cherries during the summer, but not this year. I believe the overgrowth caused a lack of circulation and prevented the trees from producing this yummy fruit. Now that we have removed many of the lower hanging branches, I hope they will bloom beautifully next Spring and produce hundreds of fresh cherries next summer. River Birch trees are known for their graceful drooping limbs, foliage, and beautiful peeling bark. They can also grow to over 50 feet tall and like most trees they need TLC. This picture from our front yard, shows a cluster of River Birch trees in the background. The limbs are so long, they are nearly touching the ground. Their beautiful peeling bark is not visible due to the long branches covering the trunks. River Birch trees also tend to lose small branches and branchlets during windstorms. I am constantly picking up small branches on the lawn that have fallen from the tree. Please ignore the unsightly landscaping but take notice of the restored walkway HERE! Unlike other trees, that should be pruned in late Fall to early Spring, the River Birch tree has a different timeline. If pruned too early in the year, when awakening from their winter rest, they bleed a heavy flow of sap. The best time to prune River Birch trees is late summer or early Fall. By pruning at the proper time, we will avoid sap flows, and the egg laying season for most insects that infest pruning wounds. These insects cause unsightly damage, and they can spread serious diseases and kill trees. We can reduce the risk of attack by pruning after their early summer flying season. Limbing up, removing all the low hanging branches from the River Birch trees, has opened up the space immensely. We can now enjoy the beautiful trunks of the trees and pretty peeling bark. Remove dead, diseased and injured branches. Branches that rub together allow entry points for insects and disease, one of the branches should be removed. Branches that grow nearly straight up have weak attachments to the trunk. Taking them down while they are small will prevent them from breaking off later. Remove a branch that is too close to another branch, this is best done when the tree is young. Remove branches that are too close to the ground to make landscaping easier and allow for more comfortable shade. 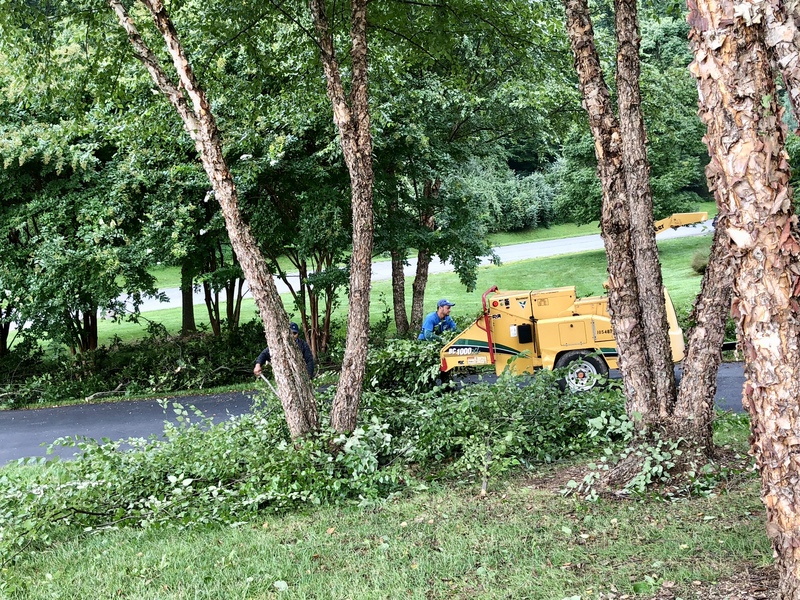 We enjoy the privacy of backing up to large trees in our backyard but when they start encroaching into the yard and over the fence, it’s time to get serious. Removing all the branches that are hanging over the fence gives the yard a clean and well maintained appearance. Notice the grass that died due to hanging branches over the fence? Removing the lower branches from the trees will allow sun to shine down on the open space and grass will begin to grow. And the space looks cleaner and well groomed. The branches are efficiently shredded and removed from our property. I am also planning on limbing up the lower branches on our crate myrtle trees and then giving them a heavy top pruning in February. How about you? Do you regularly trim trees on your property? Hello! I enjoy your posts as much as I enjoy your lovely comments and visits. You have put so much on your blog and share with blogging world, so I have nominated you for Blogger Recognition Award!! Thank you so much! I am honored to be awarded the “Blogger Recognition Award”!! Woo hoo!